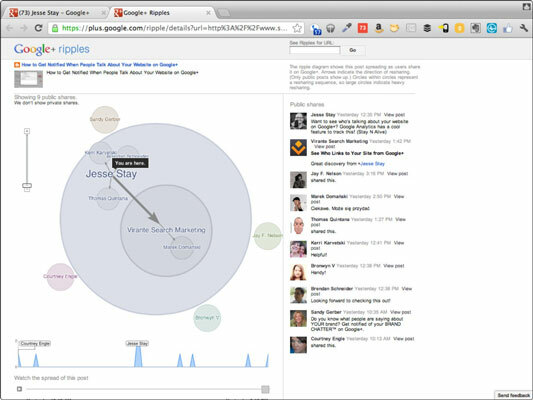 Google+ offers an analytical tool called the Ripples feature. Google has given one piece of analytical information for each URL that a user chooses to share on the service. The available public data includes posts from normal user accounts (your own and those of other people) that Google+ Pages can use to determine ripples — how the URLs you share spread around Google+. On any post with a URL in it on Google+, click the little upside-down triangle (or down-arrow) in the upper right of the post. A drop-down list appears, showing what you can do with that post. This works for any post with a link in it, whether it’s on your profile and pages or posted by other people and pages in your news feed. A new page opens, showing you all the ripples belonging to the shared URL across all of Google+. The Ripples page is a graphical representation of all the times you or others share any URL on Google+. Each share is represented by a circle; the size of the circle depends on the influence of the person or page doing the sharing. You also see circles within circles and arrows pointing between the circles; each of those is a person who shared as a result of another person’s share, resulting in chains of influence. The ripples themselves: The main section of the Ripples page is the visualization of the ripples themselves. You can zoom in and out of these representations to see the names and dive into the specifics of who shared and how they’re connected. A list of all the public shares, who shared them, and what they said: On the right of the ripples is a list of all the people who shared the given URL and what they said. You can scroll through this list to get an idea of people’s impressions of your post as they share it. A link to the original URL: At the top is the link to the original URL. If you want to visit this URL, you can use this link as a shortcut. A timeline of how the URL was shared: Below the ripples, you can see a timeline graph of how the URL was shared. Clicking the Play button (the triangle button) plays the timeline for you and shows you, in real time, the momentum of how the URL spread — and who shared it at what times. The ripples update in real time as they are shared by each individual. The top influencers: Below the timeline you’ll see some miscellaneous stats. One of these is a short list of the top influencers to share the URL and how many shares resulted from their own shares of the URL. Statistics about how the URL was shared: In this part, you can see the average chain length (how many shares on average resulted from an individual), the longest chain (who caused the most shares and how many resulted from that one individual), and the number of shares per hour. Languages the post was shared in: Want to see how well a URL is doing internationally? Use this to see what languages the given URL is being shared in and how fast it’s growing in each language. The real reach of your shares: The number of shares on a post is not an accurate measurement of how well your post did. Knowing how many of those who shared your post also had their posts shared — and how many times the URL you shared actually got shared after you posted it — gives you much more accurate data on your influence. Use this to measure how you’re doing. How fast a URL (or your shares) spreads and why: Using the timeline feature, you can see how quickly the post spread after you shared the URL. Was it because another person had already shared it? Was it because a particular influencer took hold of it? Did it start growing right around a particular ad campaign or product launch? Who your top influencers are in a very real metric that follows the entire chain down: Because you can track the total number of shares caused all the way down the chain from a particular influencer, you can measure true influence of an individual. Who influences the influencers? Who was the real reason for all your traffic? You can look at this through Ripples. The ability to be a part of the conversation as a URL that you own or have shared spreads: Because you can see all the people talking about a given URL, you can go through their conversations and comment on them. Participate in the conversations so you know what people are saying about your content. Make every share you make on Google+ a personal one.